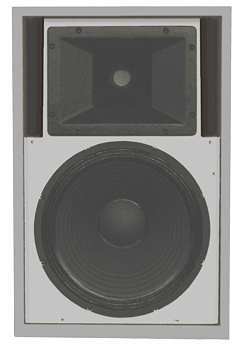 Many of our customers require a high power loudspeaker with a driver of more than 1", but reasonably priced. We have been looking for 1.4 and 2 inch drivers. Most of the 2 inch drivers are too expensive or don't go beyond 10 kHz. The Oberton driver D3672 that we chose is a compromise since the frequency range goes beyond 10 kHz. In conjunction with the horn H955, providing a constant but slow drop, the frequency response could be extended with the support of the crossover to 15 kHz (-8dB), respectively 12 kHz (-3 dB). 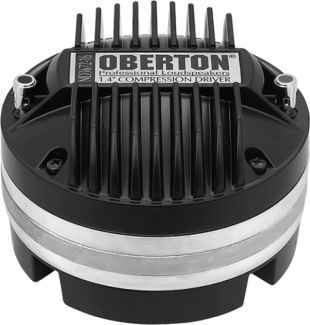 The proven Oberton 15B450 was added as bass driver. In an 80 litre volume bass reflex cabinet the frequency range starts at 48/60 Hz (-8/-3 dB). The following frequency range was recorded with calibrated Clio microphone. The cabinet was not damped (that's normal for PA speakers) with the exception of some nap foam. For hi-fi applications we recommend 2 packs of damping fleece. Additionally, the lower edge of the horn should be at ear level of the listener. Picture 1: Frequency response for the entire loudspeaker and single measurements for tweeter and bass driver. At 1.3 kHz the driver shows a slight anomaly. Otherwise, the total frequency response is quite flat. At the crossover frequency of around 1.5 kHz the intersection of the sound pressures (red and green curve) of the individual drivers are roughly 6 dB below the sound pressure level of the loudspeaker (black curve). This means that the crossover drives the drivers in phase. Picture 2: Frequency response of the loudspeaker at an angle of 0 degrees, 15 degrees, 30 degrees, 45 degrees and 60 degrees. Up to an angle of 30 degrees the physically determined grouping effect (clearly noticeable at the crossover frequency of the bass driver at 1.3 kHz) is still low enough. Picture 3: Impedance dependant on frequency. The bass reflex tube's resonance is quite low. The cabinet should be assembled using 19 mm panels; it's very easy to built since all walls are in a right angle to one another. The bass reflex port should be slightly slanted. The crossover components need to be mounted on a wooden panel and attached to the inside of a wall. The terminal may be mounted anywhere on the rear wall. All drivers are to be screwed onto the baffle from the front. For hi-fi applications we recommend, in addition to the nap foam for the rear wall, 2 packs of damping fleece. Do you prefer a more professional cabinet? Then we recommend to taper the rear of the cabinet. The front wall should, therefore, be 2 cm wider (i.e.. 480 mm). To ensure the same volume the cabinet needs to be 130 mm deeper (i.e. 500 mm). The rear wall's width is then 212 mm. The crossover components are of high quality (foil capacitors, air core coils and one i-point coil); a crossover building instruction is included. In case you prefer to mount the crossover components on a PCB with Cu spots, we recommend to use 2 PCB's per loudspeaker.